Recently, there's been a lot of talk about Shoyu , Tamari and Miso, not just the spices used to cook them but also their miracle medicine that has beneficial effects on our body. Shoyu along with Tamari belongs to the two traditional asian soy sauces. It is created by the process of fermentation known for hundreds of years, of a mixture of soy beans, roasted wheat, water, and a fermentation catalyst (Aspergillus Oryzae). It goes through a long process of natural fermentation, during which the less easily digestible materials like starch, proteins, and fat turn into more easily digestible amino acids, simple sugars, and fatty acids, while still keeping all the nutrients that are beneficial to our body in the process. Tamari, unlike Shoyu, is made only from soy beans and is created from a different process: It is a bi-product of the creation of Miso. Its yield during production is a lot lower than with Shoyu, but it contains amino acids and microorganisms of a very high quality. It is roughly 3 times more concentrated than Shoyu sauce. Shoyu and Tamari are used as a universal spice which gives a natural refreshing taste to almost any food, including fish, wheats, vegetables, soups, salads, and even sauces. Amino acids stimulate our taste buds and work especially well with meatless dishes. Glutamic acid (the natural form of monosodium glutamate) gives it great properties during marinating and fermenting. When using soy sauces as a flavoring, it is generally best to add it to a food right before it is finished cooking. The short time that it is cooked causes the sauce to highlight the tastes of any food. If it was cooked for longer, its delicate taste could be lost. When we use soy sauce in soups, sauces and sautee, we can add a bit of sea salt when we are starting to cook. This highlights the other tastes of the prepared dish. Soy sauce can then also be added before serving, but after cooking. It is the perfect spice to add when preparing tempura or other deep fried dishes, such as fish, tofu, or others. We can of course use the sauce as a table seasoning as well, but to preserve all of its qualities the bottle should be closed thoroughly and kept in a cold, dark area. Miso is a fermented, matured paste created from soy beans, salts of a fermentation catalyst and often some kind of wheat or grain. It contains live enzymes that help our body digest food, as well as essential oils, minerals and proteins in a balanced amount. It is a favourite of the medicinal cuisine of the world. It is a good source of amino acids, some vitamins, and minerals, while also being low fat and containing low calories. Its daily consummation lowers the level of cholesterol in our blood, as well as disrupts certain carcinogens, stops the effect of radioactive rays and negates the influence of a dirty climate. Genmai miso - Made of brown rice and soybeans, this is the most commonly sold type of miso and is naturally gluten-free. Mugi miso - Created from barley and soybeans, it has a more intense taste and a darker colour than rice miso. Shiro miso - This one is made of white rice. It is bright and delicately-tasting, containing the least salt of all the miso types. Hatch miso - Made of soybeans but matured longer than any of the other types. 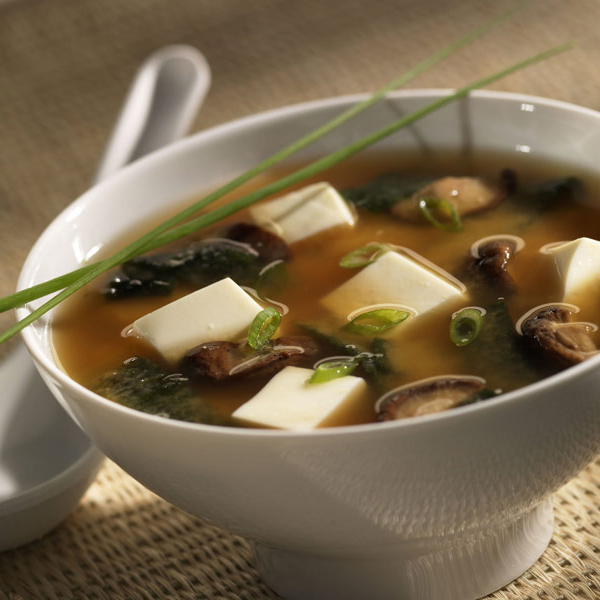 Miso is a good ingredient when preparing soup, sauces, marinades, fish dishes, and for treatment of seaweed and vegetables. It is used in a well-known japanese soup of the same name: miso. When adding miso into soup, we wait for roughly 3 minutes before finishing so that the enzymes and microorganisms do not denature and its refreshing taste is kept intact. Miso also has excellent medicinal effects. According to research, it contains alcaloid acids which bind heavy metals and stroncium to themselves, before being rid of by our organism.